How do those magazines always seem to come up with those awesome photo display ideas? Why is is when you try the same photo display idea at home it never looks the same? One reason is that most average people do not really take the time to evaluate their homes and spaces properly! Every wall display you see in a magazine has been carefully planned and designed to coordinate to the style and layout of the room. I know, it seems like it should be easier - but the extra steps you take to design your wall will be worth effort when you see how beautifully it all comes together. 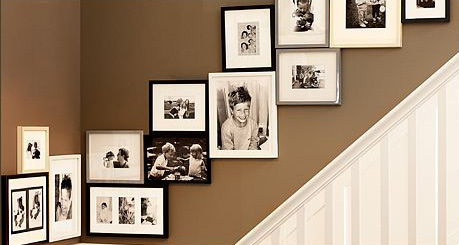 Here are the top things to consider when considering a photo wall display for your home. Be sure to pick a wall in your home that gets plenty of viewing space! The purpose of the display is to allow friends and family enjoy your special images, so hiding it in a spare bedroom does not make much sense. If you are considering a hallway location, be sure the hallway is wide enough so that people do not bump into your display knocking them off balance. My personal favorite spots are stairways and living rooms because they usually offer plenty of wall space. Consider your furniture placement as well, since the photo wall is meant to accent your space this is an important part of creating your wall. If you have an 8' wide wall with a couch on it, then (3) 8x10 images are going to look pretty silly above it. Spaces like this require larger prints and bigger displays. But on the other side, if you have a 2' wall with a table up against it, then you do not want to put a large image in that space. When choosing frames and pictures to use, it is important to keep some consistency among the elements you select them. When selecting images you can choose either all black and white, all sepia or all vibrant colors-whichever you choose they should all be the same. It is very hard to create a photo wall with various image styles and we never suggest doing so as it leaves the viewer unsure of where to look because some images may stand out more than others. If all the images work together in the same color tone, then the viewer will have an easier time skimming through all the images. When choosing frames the most important thing to keep in mind is that is best to either have the same size frames for all your images, in either the same or different colors, or you can choose different sized frames in one uniform color. Again, this is to allow the viewer and easier "view" of your gallery. If you have too many different sizes in all different colors it will be very confusing to the viewers eye. When choosing framing, be sure to keep the frame styles consistent as well. This means if you are using a modern style frame, then use all modern frames in your display, if you like a more ornate frame, then use all ornate frames throughout the display. Do not mix and match frame styles on the same display. This is the part that homeowners seem to dread the most, but with careful planning and patience, the outcome will be stunning! Make sure all of your frames have picture hangers in the back and be sure to have a level, pencil, hammer and nails on hand. The first thing to consider is how much space you would like between each picture. This will obviously depend on the space you have to work with, but a general rule of thumb is 2" - 3" between each frame looks great. A great way to start is to do a quick sketch of how you think the images will look best hung. Once you have a general "visual" it will help you see how to best layout the wall. Once you decide on where to hang the first image, then you can work out from there deciding on placement. Whether you choose to hang them in a "formatted" style where everything lines up perfectly or in a more creative "all over" look, it is important to space them frames consistently. tip: I confess, when I create photo walls for my clients. I cheat, and I am not afraid to admit it! I purchased a big roll of craft paper and cut out sheets of paper to the exact sizes of the frames that we are considering for the wall. So if I am doing a display of 6 images, I will have 6 pieces of paper that will replicate the size of the FRAMED image and then I will hang those on the wall with tape-this allows me to easily move everything around and measure everything correctly. When I am done a take a picture and give the client the picture with all of the exact measurements! Be assured that this is an art, and it does take time and patience to get it right! But the efforts will be so worth it once your wall is complete and able to be enjoyed! If you have questions about the process listed above? Feel free to leave a comment and we will be glad to help you!